We can help find the perfect Limos for everyone in the wedding party with our San Diego Wedding Limousine Rental Services. Whether you want to transfer the whole wedding party or split the groomsmen and bridal party separately, we can put together Wedding Discount Packages for Wedding Getaway Cars, Wedding Limos, and Wedding Shuttles when booked together. We guarantee you will have an amazing time with any vehicle we set you up with at The Lowest Limo Discount Rates in San Diego. 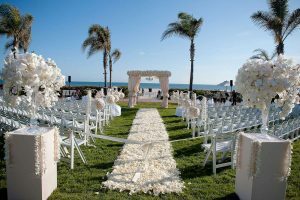 We receive every type of request for Weddings so we know what to expect. 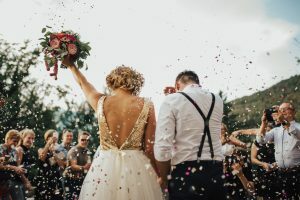 Choose from our wide selection of San Diego Wedding Limo Rentals to transport the Bride and Groom between the Ceremony and Reception or as a Wedding Getaway Car. We have White Lincoln Limos, White Escalade Limousines, White Chrysler Limos, and more! Looking for something a little different? Check out the Classic Vintage Cars, Luxury Sedans and Luxury SUV's available for all Wedding Transportation. Many Wedding Venues can have minimal parking or the location is tucked away and sometimes difficult to find. We can help minimize these issues and out of town visitors with our San Diego Wedding Limo Bus Rentals. We can set you up with a Limo Bus or Party Bus up to 50 passengers for a luxurious ride experience for the whole wedding party, or Charter Buses up to 56 passengers. Reserve one or multiple buses to shuttle between locations during the entire day or night. We also have Mercedes Sprinter Vans up to 14 passengers for smaller group shuttles. Just ask any of our amazing sales representatives for further information. We have perfected the way we price out Limo Transportation Services in San Diego. San Diego Wedding Limousine Rental Services Pricing can easily be determined using our internal software with prices that have been intricately negotiated with multiple Limo Companies throughout San Diego. All Limousines, Sedans, and Buses are available with Point to Point Rates, One Way Transfers, Hourly Service Rates, and Hybrid Pricing. The minimum required hourly rates will differ from vehicle type, weekend or weekdays, and vehicle size, like Limousines, Party Buses, and Charter Buses. While we extend our Massive Industry Discount Rates to all our clients, our partner companies may have additional charges on top of the standard hourly rate. These may include an additional gratuity percentage or tip, taxes, or fuel charges. Airport Transfers will be higher or add additional charges because of required licensing fees needed to enter the Airport shuttle area. Be sure to check out all our different San Diego Transportation Rates. The sooner you make your Limo Reservation, the better opportunity to get your vehicle at the lowest rates possible. Disclaimer Avery Limo Broker functions as a brokerage service. Our services for transportation are with an agreement through various limo companies and establishments in San Diego and surrounds county. Upon confirmation of reservation we provide the following information: vehicle size and type Photos if requested cost of deposit that our client agrees to pay contact information of the limo/transportation company that will be providing the service. We always tell our clients to contact the company before the date of their reservation to double confirm all of this information. In addition we ask that that our clients take the time to do their due diligence by inspecting the vehicles in person before hand. The contracts and responsibilities of transportation are solely through the transportation company and the client. This means that the transportation companies themselves are responsible for the representation , quality of service and conditions of their vehicles .This is also true for the establishments clubs , venues , etc . Clubs / Venues have the right to refuse entry , service at anytime and AveryLimoBroker cannot guarantee their compliance. Deposits are help by the transportation company and come out of the total sale amount the deposit is non-refundable, although they do reserve the right to allow a transfer of a deposit for a future booking. By clicking the check box the client agrees to receive contact from AveryLimoBroker and acknowledges they have agreed to and read these terms.